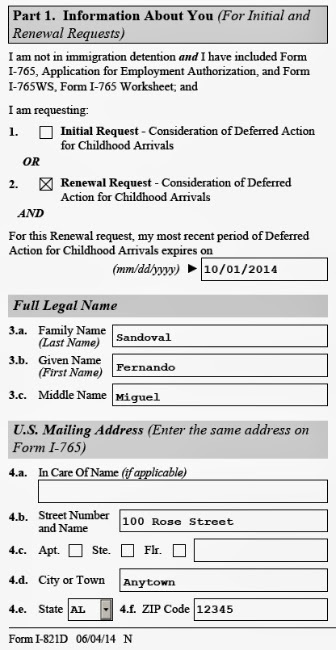 If this is the first time you are applying for DACA, please check the Initial Request box (1). If you were already approved for DACA and have a valid approval on the day you are applying (ideally, you should have applied at least 120 days ahead before expiration because if you apply later, chances are that you will not receive a renewal before the expiration and during the course of that period, you will yet again be out of status and can not only be deported but you will also no longer have authorization to work legally because your valid Social Security number alone is not sufficient for employment; you must also have a valid employment authorization from DHS), check the Renewal Request box (2). In the box below, indicate the date the DACA approval is expiring and it should be the same as indicated on your approval letter and/or EAD card. Full legal name (3 a, b, c): Simply write the name as it appears on your passport or other identification document that you plan to use. US mailing address (4 a, b, c, d, e): Simply put the address where you receive your mail and hopefully it is the same as the address at which you live, though, technically it can be different.